Anyone following along at home knows that I’ve been a fan of, and friends with, the Grand Rapids, MI based black metal band Discarnatus for some time. They’ve been favorites to see live in the local scene, always putting on a mesmerizing show, and really go the extra mile to bring the darkness and evil. Well, they’re at it again. 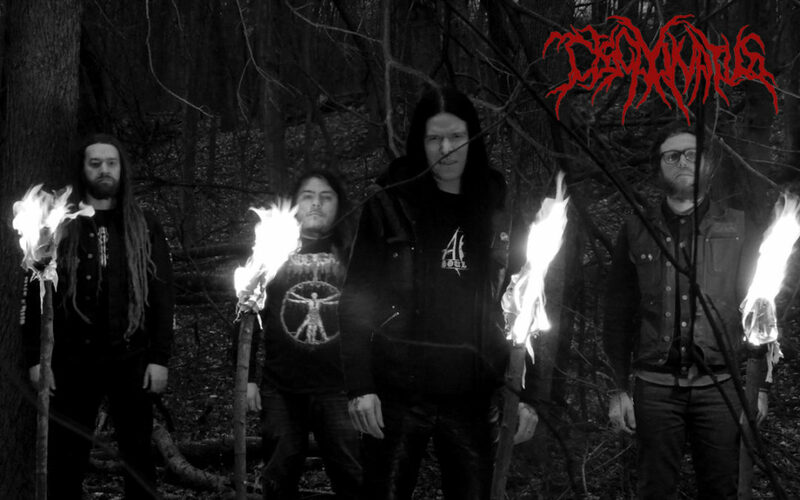 Mid-January brought the release of their latest EP entitled Condemned to Darkness. Though I missed the release show, and can’t speak to the madness I hear occurred there, I do have a copy of the EP in my hot little hands, or rather in my ears. Featuring four tracks of their familiar meaty, dissonant black metal, and a run time of a little over twenty minutes, Condemned to Darkness will hopefully serve as an appetizer to a near future full length release by the quartet. Fermented deep in the underground depths of pandemonium, this release contains many familiar aspects of the Discarnatus sound. First, the density of the material remains near impenetrable, like wearing sunglasses on a moonless night, knowing that you are hunted by creatures of the abyss. The mix of savage drums, meaty bass, feral riffs, and demonic vocals is much as it has been on past releases, still lurching forth corpse re-animated by your friendly neighborhood necromancer. There are also a couple of new wrinkles, however. First, the production is raw, harsh, and obliterating. Second, the level of dissonance, in the riffs especially, has been stepped up considerably. It’s especially this second fact that puts this release on a new, higher (lower?) plane of madness for me. Listening to Condemned to Darkness places your psyche in a maze where the pathways close just as you reach them and the bottom drops out when you least expect it. There is no leaving the maze. Welcome to the darkness.